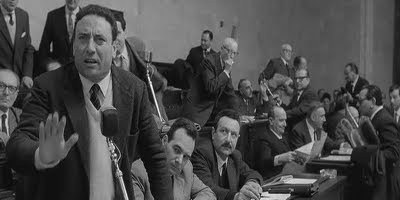 Highly political Francesco Rosi study of capitalist pig real-estate developer Rod Steiger struggling, not to mention, sputtering and gesticulating wildly, over his derailed political ambitions. This is the result of a nasty and stunningly filmed building collapse in Naples. Steiger's sleazy empire is built on worker neglect and his own greed, and though some of the movie's meetings between magistrates, city leaders, and plenty of wailing Neapolitan peasants are long and dense with bureaucratic lingo, the combination of Piero Piccioni's exceptional score and Steiger's convicted performance create moments of high drama. The supporting performers are so believable because most of the characters are the actual people they're playing. Beautiful opening sequence.